Some think that Christmas was a "Silent Night." Far from it. It was filled with shouting, singing and screaming! It was as noisy as any of our Christmas celebrations. 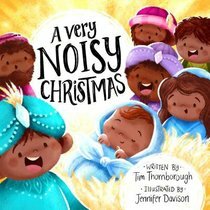 This fun and fresh retelling of the Christmas story comes with sound effects so that children can join in as parents read to them. But it also shows children that at the heart of the Christmas story is something we should all be quiet and see: God's son Jesus was born, so that we can be friends with God forever. Now that's something worth shouting about! A wonderful Christmas gift for children aged 3-6 years old. About "A Very Noisy Christmas"